Visits: 37717 persons viewed this recipe. Vellayappam is a widely accepted Kerala breakfast. It is healthy, delicious and easy to prepare. Its batter is made by grinding grated coconut and rice/rice flour with the other ingredients listed below. People usually confused with varieties of appam. Dissolve yeast in 1 cup of warm water (make sure that the water is not too hot) along with sugar and let sit for 30 minutes until it is frothy. Mix 2 table spoon rice floor with 2 cups of water and boil for 4 minutes by stirring it. Keep aside and let it cool. Heat a flat non-stick pan on medium flame. Stir the batter and pour a ladle (thavi) full of batter to the pan and spread it lightly with the ladle (It should be almost double in thickness of a dosa). Cook it by turning both sides till it is slightly brown. Repeat the previous step to make more vellayappams. 1) Spread a little oil on the pan, if found sticky. 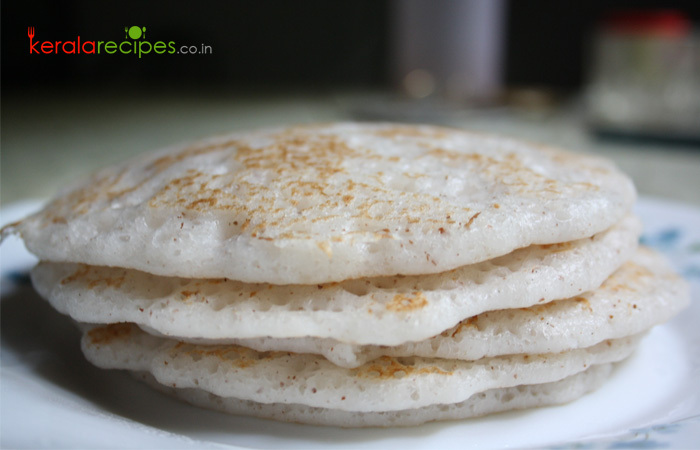 2) Each time you take the batter from the vessel to prepare vellayappam, stir well. 3) As the batter quantity increases during fermentation, use a vessel which can hold almost double the quantity. Hai, I was searching for this recipe. In winter season what should we do for easy fermentation. It is not enough 8 hours. Is there any other tips. Once I heard in radio, but I was not able to memorize. Waiting for your comment. Hi Avab, Thanks for the comment. Ferment it with rapid rising yeast or place the vessel in warm water. If you have rice thermal cooker, keep the dough in that. Please do share your feedback. Hi, Can you give the measurements to make 100 Appams please? Thanks, Vidhya. Vidhya, This is for 20 appams. So just multiply the quantity of ingredients by 5 for 100. Gladson, I will try to include the Soup recipes soon. Thanks for the feedback.